The plants spread quickly and self seeds as well, and so will quickly cover a walk, rock garden or slope. When introducing Cymbalaria into the garden, take these facts into consideration as it may overwhelm other plants. This vigorous growth makes it ideal for planting as a walk on ground cover, a wall covering, or in baskets or containers in sunny or semi shady areas . 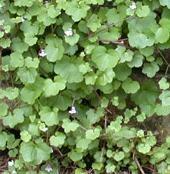 Cymbalaria thrives in ordinary garden soil in a sunny or semi shady location and is not particular about soil type. In cooler climates, it can be grown as an annual and will usually reseed over winter, even though the mother plants may die. Propagation is extremely easy and may be accomplished either by cuttings, transplanting suckers or by sowing seed. Seed should be sown in flats or plug trays and pressed lightly into the medium. Keep moist at 80F and cover with plastic or glass until germination. Seedlings should be transplanted to larger containers when they reach about 2 inches in height. Transplant outdoors when the temperatures have warmed and do not fall below 60F. Space at 12-18 inches apart in a prepared bed or plant in soil between paving stones or rock walls. Just a cool note: the flower stalk of the plant is phototropic ( it follows the sun). At first, before fertilization, it leans the blooms toward the light and after fertilization moves them away from the light. Seeds are then shed in the crevices of walls or walks in which it is planted, thus increasing the chances of seed germination. Some consider the leaves of the plant to be edible, but the taste is very bitter and large quantites may be toxic. Leaves have also been used to treat diabetes and as a poultice to staunch bleeding.